It takes a three hour bus ride and another three hours on a boat just to penetrate Taman Negara’s thick exterior,which extends over 4000 km and is over 130 million years old (while the Amazon dates back just 10 million years!). The boat ride there was wonderful, cruising past water buffalo and monkeys, a cool spray in your face and the sun sparkling off the ripples. I arrived in the late afternoon and managed to find a hostel straight away (thank god, otherwise I would have been reduced to sleeping in a tree!) FYI: It is easy to find accomodation when you arrive in the park. I had trouble booking online so just showed up and hoped for the best. I stayed in Mahseer Hostel (which wasn’t even listed online) in a $5 dorm and would definitely recommend it. It is equally easy to book day tours when you arrive in the park, and also a hell of a lot cheaper than booking in advance! After I checked in I made my way down to the riverside to locate a restaurant for lunch. I then proceeded to book nearly every tour the company offered- ironic since I purposefully avoided doing just that before arriving! I booked an Evening Safari that night, Canopy walkway and jungle trekking the next morning, a visit to a jungle tribal village that afternoon and a Night Jungle walk that evening! I was officially organized and excited! The Night Safari later that evening turned out to be one of the highlights of the whole Jungle Experience. A group of six of us boarded the 4 x 4 and headed into the forest…I even got to sit on the roof of the jeep and help the guide look for wildlife! The most exciting specimen we spotted was the leopard cat, a beauty of a creature. We also spotted spiders, birds, beetles and cows. Definitely not the tiger and elephant spotting kind of safari! (even though those animals have, on rare occasions, been spotted on the same tour) It was a great tour nonetheless purely for the experience of being in the midst of the never silent jungle surroundings. The next morning I met my group to begin the day’s hike. Our first stop was the Canopy Walkway, which claims to be the longest in the world. It was definitely an adrenaline pumping walk, a full 45 metres above the ground! It even goes higher, up to 85 metres above the ground, however that part was unfortunately closed due to maintenance. It was an unforgettable experience, walking amidst the ancient tree tops, overseeing the length of the rainforest. I definitely felt like the King of the Jungle! The trek up to the viewpoint was strenuous and satisfying. And when I say satisfying I mean stunning! A large portion of the hike was on man made steps,which was a bit disappointing, but we did finally emerge onto the forest floor where we were able to haul ourselves up by tree trunks. The group enjoyed a nice rest at the top to admire the view and then we began the trek down. Later that afternoon (after a nice long shower!) we headed by boat to visit the Orang Asli Tribe- an interesting experience if not a slightly staged and commercial one. We sat and gawked at the local people, who tried their best to avoid us, and witnessed a fire making demonstration. Fascinating but not all together genuine I felt. The night walk later that evening proved to be a similarly disappointing tour- it involved going so little into the actual jungle that we were on man made platforms the whole time, and spent our time scoping out the insect situation: spiders, birds, beetles etc. 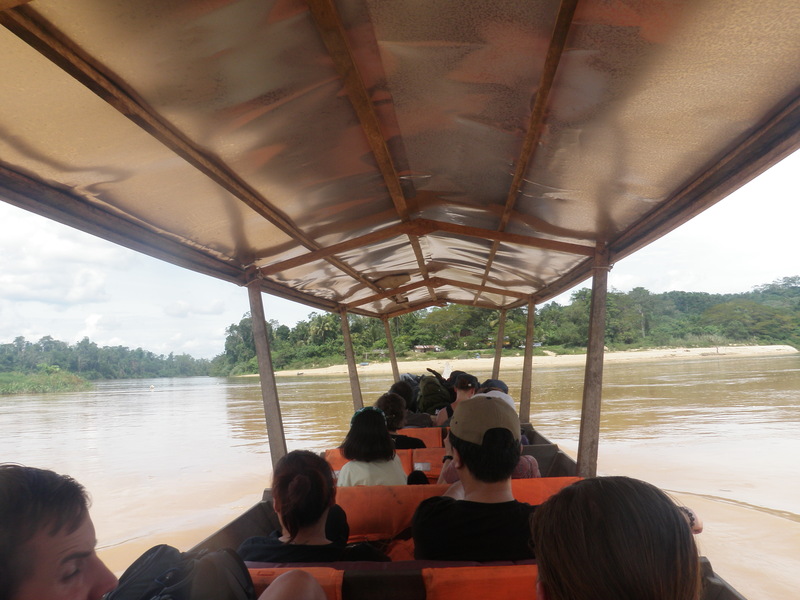 If going to Taman Negara I do not recommend this tour- another option- do it yourself! And that’s exactly what we did. The next day, my fellow traveller Matt and I decided to have a tour free day and headed off across the river to do our own trekking. We enjoyed a nice couple hours of hiking and finished off with a refreshing jungle swim (while also constantly on the look and feel out for leeches!). The next morning we caught an early bus heading to Kuala Lumpur. I was sad to leave this refreshing, exhilarating, relaxing and gorgeous corner of this earth and I have never felt more alive and thankful for being in a place during all of my travels. If you are into trekking, nature, animals and serene surroundings then this is the place for you! on a blog or if I have something to add to the discussion. Usually it’s a result of the fire displayed in the article I read. And after this article Hakuna Matata: My Jungle Experience | TravelTheatrics. I was actually excited enough to post a thought 🙂 I actually do have a couple of questions for you if you usually do not mind. Is it simply me or does it appear like some of the responses look like they are written by brain dead visitors? 😛 And, if you are writing at additional places, I would like to follow everything fresh you have to post. Would you list the complete urls of all your shared pages like your Facebook page, twitter feed, or linkedin profile? So sorry it has taken me this long to reply! Thank you very much for your comment I’m glad you enjoyed the post:) My Twitter handle is @traveltheatrics, my facebook page is http://www.facebook.com/travellingtheatrics and my instagram name is TravelTheatrics.